IDEO has mocked up the future of the book, where reading gets three new twists: informational layers (the “Nelson” prototype above), social connectivity (“Coupland”), or narrative interactivity (“Alice”). While it should be no surprise the convergence of words and tablets will open up possibilities, what’s most interesting is the probable impact on the publishing industry — soon to be replaced by micropublishing. You see, today publishing is hard and risky, with every book an unknown start-up business model, so the boys in Manhattan make money by promising to remove that friction. But what happens when friction disappears? Anyone in the future will be able to write and publish books using almost-free tools such as Apple Pages to whip up layouts and then email, Twitter, text or signal-share it to the masses. Big-city publishing houses that once vetted authors, forced them to shill through their networks to sell the minimum amount of books to get to $100,000 in break-even revenue, will fade as your son learns to publish professional views on the final Hogwarts twist to his friends in 6th grade via $99 iPads. Write. Layout. Send. You’re done. Of course this means clutter, fragmentation, the PDF version of a million Wikipedia pages. Cheaper access will create a groundswell of new content inventory 10,000x more than that on today’s Web. The pressure on publishing will accelerate, because old third-party ad models that paid for some editorial gates (once called “magazines” and “newspapers”) will be small compared to the wordsmith tide. There aren’t enough advertising budgets in the world to fill all that space even at 5-cent CPMs. Advertising will still work, but only in subsets of the content, the Super Bowl/Harry Potter hits of the world that ride the Pareto power laws above the long tail of mass self-proclamation. The twist is that individual writers, unlikely to scale to Rowlingesque masses in this new sea of content, may start charging more for their own work to the few who are interested. When content/writer/video/photo producers hunger to make money and marketing can’t subsidize the costs, the creators will want a greater slice of publishing pie. Books will still cost money, but perhaps you’ll pay it to the close circle of friends who write what you want. Micropublishing will arrive because in a world of perfect informational networks, the closest distance between two nodes is a straight line. Tablets, beam away. Miss the conference? Visit Fora.tv. If you want to watch Wikipedia founder Jimmy Wales riff on search engines, Fora.tv gives you an intellectual alternative to YouTube. The site launched in early 2007 and recently attracted Portfolio deputy editor Blaise Zerega as president and COO. 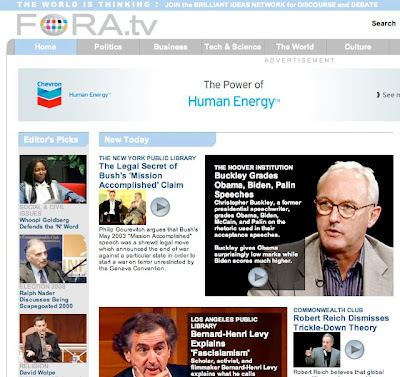 The site has a dizzying array of video from leading minds. 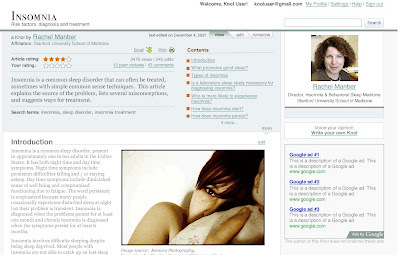 We count 28 brainiacs on the home page, with topics such as human capital, cell phone adoption, environmental damage, Google’s research into geothermal energy, and educating women in Afghanistan. NPR has met its match. Wikia search launches. Google quivers? If Netflix and Google had a baby, it might look like this. Jimmy Wales, the guy who brought us Wikipedia, today launched the new Wikia search engine. Story is, Wales wants to make an open source algorithm that combines the best of computer analysis with crowds of humans ranking relevance. Early reviews of Wikia have been a bit unkind. And yes, human-powered search engines have sputtered to failure before. But Wales isn’t anybody; his Wikipedia is one of the top 10 sites in the world, and the millions of people using it have made it as accurate as Encyclopedia Britannica. Wikipedia itself started as something of a fluke; it was originally designed as a feeder network for another encyclopedia, Nupedia, but took off as human contributions exploded. We suggest it is unfair to judge Wikia right now. Part of the wisdom of crowds is, crowds aren’t typically very smart when they are just forming. Wikia is just a babe, and so far it looks a little thin. But keep your eye on it … Wikis have a way of growing up. Google, king of search advertising, this week takes on Wikipedia in a quest to become the knowledge center of the Internet. Google has launched Knol in beta, which allows individuals to post encyclopedic descriptions on any topic — and get their personal name in lights at the same time. Make no mistake, this is not a public service — this is about cold cash. Wikipedia is a huge destination, the 10th most popular web site in the world … and if Google can approach that level, the traffic Google draws to Knol will rival that of its main search web page. In 3 or 4 years, Google could have two advertising platforms, Google.com where searchers start, and Knol, where searchers will go for the first taste of information. Catching Wikipedia won’t be easy. Wikipedia has a 6-year head start with 9.1 million articles in 253 languages. 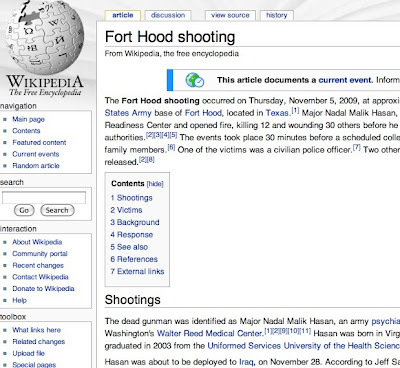 Each article is written collaboratively by scores or hundreds of users, and while occasionally vandalism creeps in, the overall tendency of users to be experts in the topics they write on, and to quickly delete anything suspect, makes Wikipedia incredibly accurate. A recent independent study found Wikipedia matched Encyclopedia Britannica in reliability, and it has become so valuable that Harvard includes Wikipedia in its syllabus. Knowing it faces an uphill battle, Google tosses in some sweeteners. Contributors get their names mentioned prominently, as well as their photos and a brief bio. Yes, you can become famous as the first Knol contributor for the house sparrow passer domesticus. And Google will allow authors to share in profits from ads that appear next to their copy. There is a potential conflict of interest. If we search for “media planning,” will Google now link us to the Google Knol on media planning as the first search result? Will its self-interest in making knols the first destination for content mean Google can rank its own pages higher than others, even if others are truly more relevant? No matter. Knol should scale quickly, because at heart it’s a new tool for business development. Your name and your organization will be featured as experts, and there will be links back to your organization. Google has just created a new platform for the world’s attention, and all the No. 1 slots are still vacant. You can almost hear the frantic typing in cyberspace this weekend … because the new Knol gold rush is on.